June | 2011 | takilya ni leaflens - dakilang #filmmiron ever! Hm, they say that the folly of Filipinos right now is that we don’t know our history or we don’t really learn from it that much so we repeat our mistakes over and over and over and over again… Yeah, just look at our government right now. But hey, let’s talk about films… my friend. Friend daw, o! Chos. In short, here’s a long rant — er, review — about a recent film I saw. Thanks for the invite-sabit* (*incidental tag-along) sa premiere, though. Anyway, here goes. Hold on to your postcolonial butts. 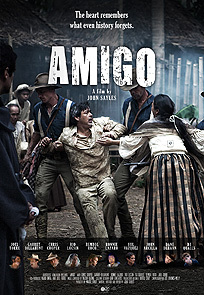 Pitch: Set in a rural town somewhere in the Philippines, the film tells the usually untold tale of what happened during the American occupation of the Philippines right after/overlapping with the tail of the Spanish occupation, focusing on the town leader’s struggles as they are caught between two imperialist forces and helping the Filipino underground movement battling colonial rule. Catch: Historical fiction at its finest should be also at its cinematic? Hm ewan. Just saying. Let’s start with the great points. 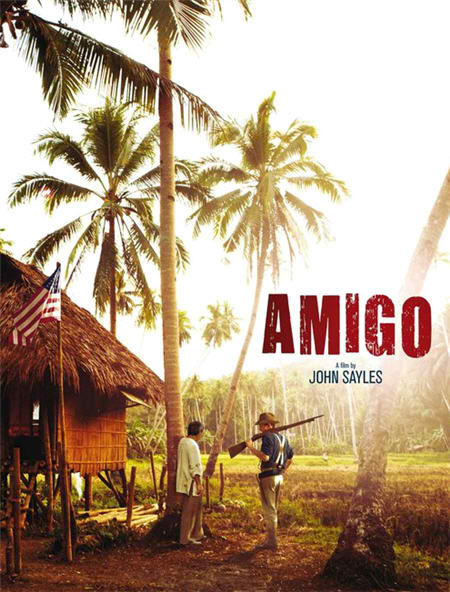 It’s good that acclaimed American independent film director John Sayles — he of The Secret of Roan Inish fame — came here and shot this film entirely here, in Bohol (south of the Philippines) and had a great cast and crew, with the crew being mostly Filipinos, some of whom are our film school grads. I’m glad this gives the local film industry practitioners quite a boost so if only for that, please go to the Metro Manila movie houses on July 6 and watch this film and support it. Also, it’s good to support such a film that narrates what historical evidence we could have regarding our nation’s past. Never mind if it was written by a foreign storyteller or viewed through a foreigner’s lenses. It’s always interesting how they frame us and how they see us, since we also frame them and see them in different angles as well. Di ba? Okay fine, so granted that this is a “historical fiction based on real-life events” chenelyn like what some write-up somewhere said. I think it’s still necessary to establish at least a good footing in terms of the perceived/imagined location because that really gives viewers the necessary grasp of the setting, which is very important in storytelling. One could argue that the labeling (or the lack of it) in this film would be enough for viewers who don’t know jack about the Philippines. But how come foreign films put such details in their films and we seem fine with it? Like I would have never appreciated Montmartre if not for Amelie, for instance, or I would have never gotten to know New York that much — before actually visiting it — if not for Woody Allen’s films. You get the drift. Location as setting: very important. So yes, I don’t want my country to be just a “generic Anywhere, Philippines” when it comes to that point. But I know, I’m nitpicking. Let’s get down to business — storytelling and content. Hm how do I begin? Granted that Sayles is a fine storyteller but somewhere in the characterization of the leads here defies that. Like I’m not sure where the compassion and the change of heart of the American lieutenant is coming from. On the one hand, he is a semi-ruthless imperialist schmuck who throws orders to get what he wants and to have everyone obey him. On the other hand, he then appears like a gold-hearted wimp in front of his more vicious American colonel (played well by Oscar award-winner Chris Cooper) when he finds his colonel’s commands as a bit “harsh” for the town because, like he said “but we have to live with these people…” I mean hello, yes, you Americans lived with these Filipino townsfolk but I didn’t see you treating them warmly, especially their town head or kapitan del baryo (played brilliantly by Joel Torre). Hmmmm. Failure in image presentation? Or possible plot loophole? I don’t know. Speaking of characters, I don’t even know who is the main protagonist of the film. It could have two: the American lieutenant who has very murky character developments and the kapitan del baryo who has clearer character goals. But sometimes, they seem to be competing for the I’m-the-central-character role that it gets distracting in the overall plotting. Plot-wise, the ladder of storytelling is clear-cut but some messages in between the steps seem to be loose. Like I don’t know whether the film actually wanted to say “Sorry Philippines, we did this to you. Love, America” or “Hi Philippines, hate America more and let this remind you why.” There are some scenes where the former resonates and there are some scenes where the latter resonates as well. But in terms of “presenting a hidden history not often told” as they pitched to us before the movie began, I’m not quite sure what exactly is hidden here. In short, tell me something I don’t know: Pinoys got fucked during American colonial rule, and I know that already, saw that already, read that already, watched that already. Maybe this is new/news to Americans who don’t know jack about which countries their beloved homeland has invaded over the decades. Or maybe this is also new/news to Pinoys who don’t seem to care about their nation’s history as well. Well then, like Sayles said in the premiere (yes, he was present), people nowadays seem to learn about history from films and TV, so here it is. Ayuz. So yes, if only for that — learning about our nation’s history — please watch this film, especially if you are not the type who actually reads books. But regardless whether the story being told is “old,” there should be at least some kind of new treatment to it. No, I’m not asking for a Baz Luhrmann type of redoing, like how he jazzed up like psychedelic crazy Shakespeare’s Romeo and Juliet back in 1996. Maybe have the narrative pacing a bit more engaging by crafting better dialogues and executing better scenes? Maybe edit the film down to sharpen the focus of the narrative? Maybe stitch clearer plot lines tighter? That would actually do. Just saying. Maybe my heart can't feel it because my history remembers another thing... Chos. 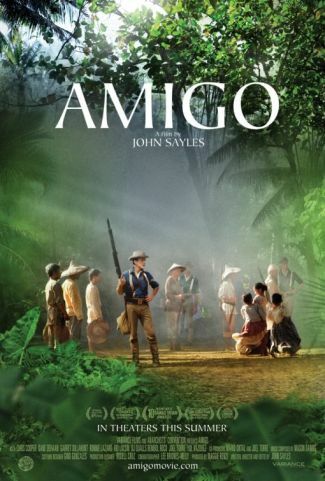 But who am I to dis a John Sayles work done in the Philippines? Not that I want my country to be better represented in film, but I only want to see a good narrative done on film about my country, whether it presents skeletons in the national closet or discusses cultural gangrene. This film is not yet there, but I wish it were. Sayang kasi, e.
Anyway, they also said in the premiere that they hope more Americans would come here and do more films here. Hm, but they already have been doing this. Um, Apocalypse Now? Francis Ford Coppola was here with a wide-eyed little girl named Sophia. Born on the Fourth of July? Oliver Stone shot that in Ilocandia and had his cast and crew sleep in Vigan, and he also edited Platoon in the defunct motion picture lab at PIA along Visayas Ave. (where I also edited my 16mm undergrad film thesis). Hm. History lesson ex-ed. Heniweyz, it’s a great effort, really. I just wish it were a bit better. But that’s just me. Go ahead and watch it pa rin, and see for yourself na lang. You might say I’m just bitter about America, but that’s another blog post for another time. Anyway, we’ll be discussing this film further in our Friday night Cine Chichirya radio show at DZUP1602AM. Listen to us live via streaming at dzup.org this Friday, 08 July at 6-7pm.